Today’s autonomous vehicles require hand labeled 3-D maps, but CSAIL’s MapLite system enables navigation with just GPS and sensors. MapLite combines simple GPS data that you’d find on Google Maps with a series of sensors that observe the road conditions. In tandem, these two elements allowed the team to autonomously drive on multiple unpaved country roads in Devens, Massachusetts, and reliably detect the road more than 100 feet in advance. 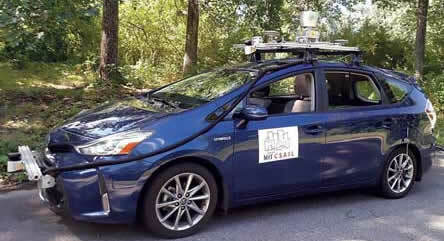 As part of a collaboration with the Toyota Research Institute, researchers used a Toyota Prius that they outfitted with a range of LIDAR and IMU sensors.